The mesh vinyl material we use to print digital banners comes in different variations, Mesh at 50/50 which means 50% Solid material, and 50% perforated, there is also 70/30 which goes for 70% solid vinyl and 30% perforated, this is our preferred material for Outdoor Banners used in Sports Fields, or under construction sites, the Mesh vinyl is perfect to be hanging on a fence, and allow the air pass through, avoiding opposition to strong wind. Mesh Vinyl is the perfect material for printing Outdoor Banner Signs when exposed to strong wind conditions. Mesh Banners are ideal for sports fields, advertising, or construction locations. We print our Mesh Banners with high-quality UV inks to preserve, and highlight your messages. As always like with our other Custom Signs, we offer custom professional graphic design service so your Banners will catch the attention of people to deliver your message, and identify your company like your other media materials. Outdoor Banners are always better made with Mesh Vinyl, it is the preferred material for outdoor Printed Signs when you are planning to use them in an open field, construction site, sports courts and more, the benefit of using Mesh Vinyl Banners is that they are adaptable to strong windy conditions letting the wind pass through, giving minimum opposition to Wendy stream. 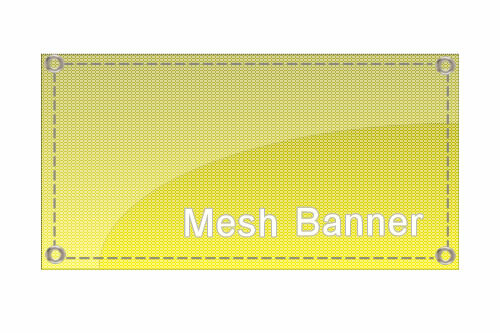 Want to order a Mesh Banner today?